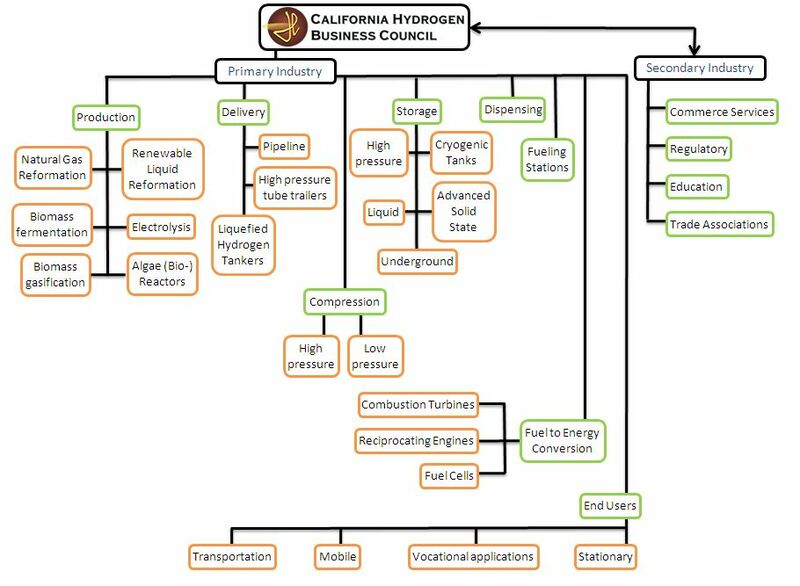 As the following chart indicates, the hydrogen industry emcompasses a vast number of connected and interdependent fields that work together. Each field has any number of companies, organizations, and individuals supporting its efforts. To see how members of the CHBC are involved, see our CHBC Member Directory >>. The CHBC works to connect more of these entitites in order to streamline and standardize information, regulation, and products related to hydrogen. Production involves the production of hydrogen gas through natural gas reformation (steam-methane reforming, etc. ), electrolysis (PEM electrolyzer or alkaline), biomass gasification, renewable liquid reformation, biomass fermentation, or algae reactors. Currently, the dominant form of production is from steam-methane reforming. Delivery of hydrogen can be done through pipeline, high pressure tube trailers, or liquefied hydrogen tankers. Existing pipeline may be used, but hydrogen’s properties limit the types of materials that can be used, or they must be specially treated to transport hydrogen. Compression of hydrogen, at high or low pressure, is pivotal in storgage of the gas, because of its low energy density by volume. Compressed hydrogen at 350 bar (5,000 psi) and 700 bar (10,000 psi) is used for mobile hydrogen storage in hydrogen fuel cell vehicles. Storage of hydrogen is also an critical step in its availability to the public, especially in fueling stations for hydrogen fuel cell vehicles. Currently, storage of hydrogen is done in high pressure tanks, cryogenic tanks, advanced liquid state, liquid, or underground, or can use a combination of these techniques. Fueling stations make up the hydrogen infrastructure needed to commercialize hydrogen fuel cell vehicles. In reality, fueling stations involve many of the sectors of the hydrogen industry. A hydrogen fueling station requires production, delivery, compression, and/or storage of hydrogen. Fueling stations require hydrogen either by transport of hydrogen through pipeline, high pressure tube trailers, or liquefied hydrogen tankers or onsite production. Development of this infrastructure requires substantial funding, commanding the focus of advocacy groups, non-profits, government agencies, and private investors. Fuel to Energy Conversion can be done through comustion turbines, reciprocating engines, or fuel cells. There are several types of fuel cells, including proton exchange membrane (PEM), solid oxide, or molten carbonate. End Users of Hydrogen for Energy comprise a wide range of applications for tranportation, mobile power storage, vocational applications, and stationary power storage. Transportation includes hydrogen fuel cell vehicles for personal use, trucks, and buses, as well as aviation, motorcycles, and marine transportation. Hydrogen energy can also be used in portable and emergency power and for military applications. One of the most common uses today is in forklift trucks. Hydrogen’s stationary uses include back-up power and grid support, energy storage from renewables, and combined heat and power applications. Commerce Services emcompass many different secondary markets related to the hydrogen industry, including consulting, legal, financial, engineering, and construction services. As applicable, it can also involve third party vendors, importers and exporters, testing and permitting, and vocational training. Regulatory groups related the hydrogen are found both at the state and federal level. This includes Air Quality Management Districts (AQMD), the California Energy Council, the California Air Resources Board, and the Evironmental Protection Agency. Education comprises public outreach by advocacy groups, non-profits, and the media, as well as any education initiatives from corporations and businesses. Universities and laboritories are leaders in education and research related to hydrogen. Many of the CHBC’s members are involved in some sort of educational projects to increase public awareness and perception of hydrogen energy. Trade Associations are coaltions between companies in the same industry, and are usually involved in advocacy, networking, growth of the business sector, and education.